We offer free waterproofing quotes in Vernon, Kamloops, Kelowna and many areas nearby. Call or e-mail us today to schedule an appointment! However, at BC Basement Systems, we have an approach to solving water problems of all types. Our solutions cover all surfaces of the basement, including the foundation walls, basement floors, and even wet crawl spaces. 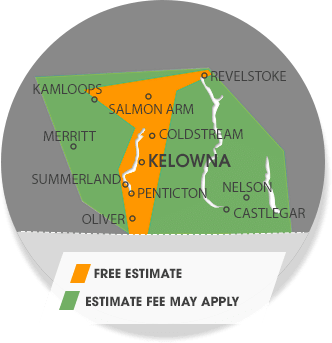 We offer free basement waterproofing estimates in British Columbia, including Trail, Coldstream, Winfield, Westbank, Armstrong, Chase, Oyama and many areas nearby. Contact us today to get started!